The City Centre offers an awesome 1,50,000 sq. ft. of shopping area. Its ambience seems to be adding a new dimension to the City's looks, what with it promising to be a one-stop entertainment destination. Lifestyle has opened a huge outlet and offers its distinct shopping options. Landmark too has a major presence here and promises to be a wonderful shopping experience. 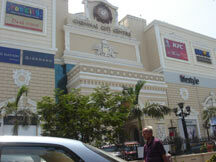 There are food courts and INOX multiplex cinemas are also here. There is a major play area for kids.